A program covering a broad spectrum of music and dance traditions from this tremendously diverse geographical region. We urge you to take advantage of this opportunity and join us in a nurturing and informal environment. --> What is Middle Eastern Music and Dance Camp? Middle Eastern Music and Dance Camp & Festival is a place where you can take music and dance classes during the day from master teachers and join the concerts every evening, and cabaret after concerts and night parties. ---> What does MEMDCamp offer? 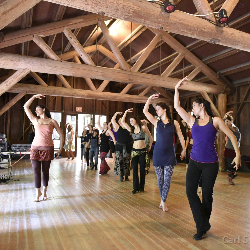 Our workshop offers a program covering a broad spectrum of music and dance traditions from this tremendously diverse geographical region. We urge you to take advantage of this opportunity and join us in a nurturing and informal environment. --> Is there any age limit? ALL AGES WELCOME. Kids and elderly individuals are welcome. Please contact Gamze Guven for details. ---> Can I sell something? Yes, vending is allowed. Please contact Gamze Guven for details. --> Do I have to pay extra for classes, concerts or food? --> CLASSES: Middle Eastern instrument and dance classes from 9:30am to 6:30pm every day. More than 50 different classes available every day. --> CONCERTS start around 8pm after dinner. --> NIGHT PARTIES till 5am with live music every evening/night. --> PLUS: Ensemble coaching, performances. Ethnic cuisine (we serve breakfast, lunch, dinner and midnight snacks). Vending options, children activities, hiking, yoga, meditating and more!